Over the past two decades, holy men in India have gone on dozens of fasts demanding governments honour their promise to revive the polluted Ganges, a river revered by Hindus. The recent death of one of the most prominent hunger strikers made headlines. Soutik Biswas went to find out more. 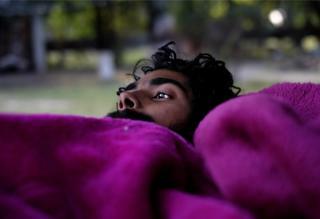 In a quiet ashram (retreat) near the pilgrim town of Haridwar, a young seer says he would die to save the Ganges. Atmabodhanand is on the 40th day of a fast begun after the ashram's most prominent resident starved himself to death two months ago. "I am ready to die," he told me. "Our ashram has a history of sacrifice." Matri Sadan is a leafy, three-acre ashram that sits on the edge of the river. Atmabodhanand stopped taking food on 24 October and now survives on water, salt and honey - his is the 60th such fast by residents since it was founded in 1997. Hindus revere the river as a god, and believe that bathing in her waters can wash away a person's sins. But the Ganges has been choked by more than 1,000 irrigation dams, the water table in its basin shrunk by reckless extraction of groundwater and its own water poisoned by toxic industrial effluent and household sewage. The river in Haridwar itself caught fire in 1984 when someone put a lit match on the water. "Indians are killing the Ganges with pollution and the polluted Ganges, in turn, is killing Indians," says Victor Mallet, author of River of Life, River of Death, a new book on the river. "This time, it is a fight to the finish. It's going to be a long haul," he says. On the day I visited the ashram, rattled authorities, panicky at the prospect of another hunger death on the premises, sent doctors with an ambulance to check Atmabodhanand and take blood and urine samples to test for blood sugar, malaria and dengue. His blood pressure was normal, and he had no fever. Much later, in 2011, anti-corruption campaigner Anna Hazare undertook a high-profile 12-day hunger strike to press for anti-corruption laws. But what makes the fasts at the ashram in Haridwar stand out are their frequency and the two deaths. "Hunger strikers believe that the voice of hunger has a power disproportionate to its source," says Prof Sharman Apt Russell, author of Hunger: An Unnatural History. "Hunger can strengthen the weak, inspire the timid, bully the powerful." But the lack of widespread public support for the fasting residents of Matri Sadan is sometimes glaring. "People have become selfish. They don't care about their own good any more," says Atmabodhanand feebly. But the reality is possibly more complex. Himanshu Thakkar, a water expert with the advocacy group South Asian Network on Dams, says the hunger strikes by the seers at Matri Sadan have had "some impact" all right. Sand mining on the river has been stopped from time to time, and stone crushing factories removed from near the river. "But my impression is fasting must be a part of a larger strategy in which people from different sections of society must be mobilised." The BJP's water resources minister Nitin Gadkari says a $3bn plan involving 254 projects to clean up the river and its surroundings is in progress, and most of the cleaning work of the river will be completed by next year. "The people's dream of a rejuvenated Ganges will soon be fulfilled," he told a meeting in Delhi recently. But the seers insist the government is not doing enough. So hunger remains a constant companion of the residents at the retreat. "I am next in the queue. This time, we will not stop," says Swami Punyanand, a 61-year-old former automobile workshop owner from Delhi who became a seer years ago. He has gone on a simple fruit diet to "prepare for fasting to death". In the hermitage of hunger, this is how they prepare to give up their lives for the river.